Every Thursday, from 19 July to 16 August 2018. No prior booking necessary, included in entrance price. From 2pm The Saltimbanques of Sabaudia. Juggling, games, comedy, two flags that snap in the wind! The inimitable Saltimbanques de Sabaudia are now at Montrottier! 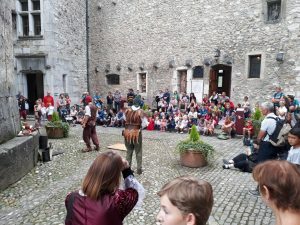 Come and see their show in the chateau’s courtyard and gardens – an ideal setting for the two entertainers who stroll around the grounds juggling and dazzling children as they go! From 2pm The Festijeux games. 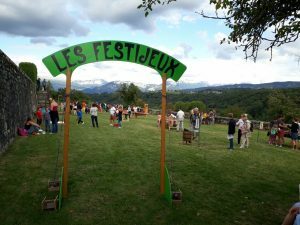 Medieval pastimes specialists Festijeux offer up 12 over-size games inspired by gargoyles, gargotes, the kingdom or the court. All were played by rogues and rascals, damsels and young squires! Instead of Angry Birds, why not try many more entertaining alternatives! 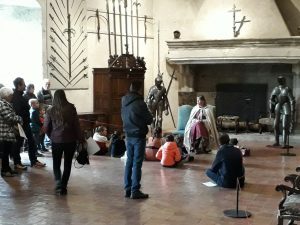 Children can also take part in a jousting tournament.